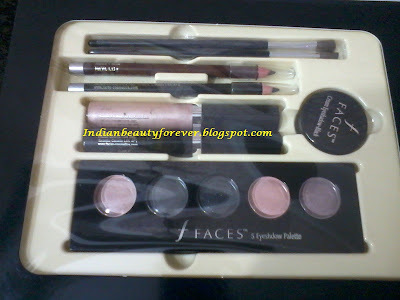 Today, I will be reviewing Faces eye shadow kit which I purchased from FashionandYou.com. Packaging- The kit was enclosed in a cardboard packaging. You can see the products once you turn the outer flap. All the products are nicely kept in the plastic case having different slots to accommodate them very well. Eyeshadow palatte- It is a decent palette with all the colors being very good and wearable. 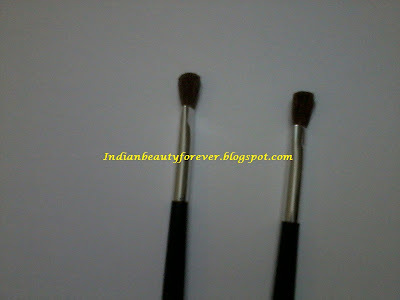 The palette also contains two dual ended sponge applicator stick. The colors provided (L – R) can be named as beige, grayish brown, black with glitters, peachy pink and light purple. 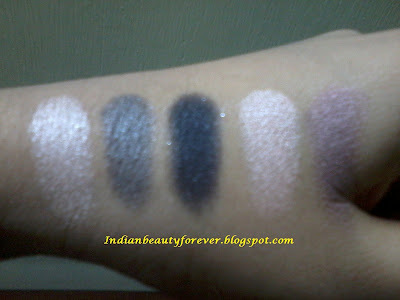 All of them has fine shimmer and velvety texture. Their staying power is 2- 3 hours that can be prolonged, if used with a good primer. In the camera pictures, the swatches may not justify the corresponding names described by me above, however in person they are same as I described. Mascara- Mascara is also a worth the money. 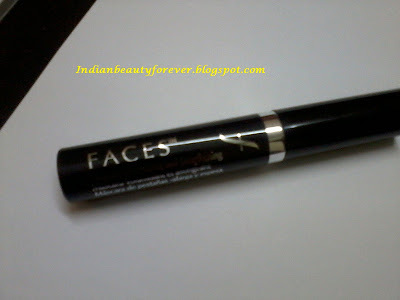 It holds on to my curls nicely and does what mascaras are meant for. Eye primer- This is an okay product with some metallic shine that it gives to your lids when blended well. 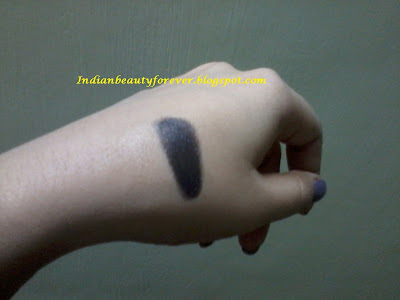 You can also wear it standalone to get that natural but pretty eye make up look with only a dash of kohl. 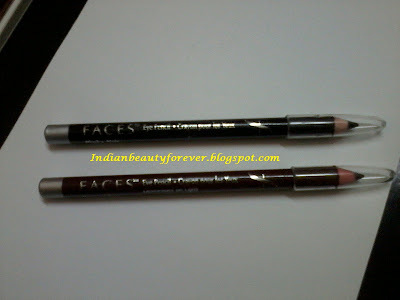 Eyeliner pencils- These pencils are creamy and doesn’t tug my eyelids. But they do smudge however can be on your lids for long if not touched. 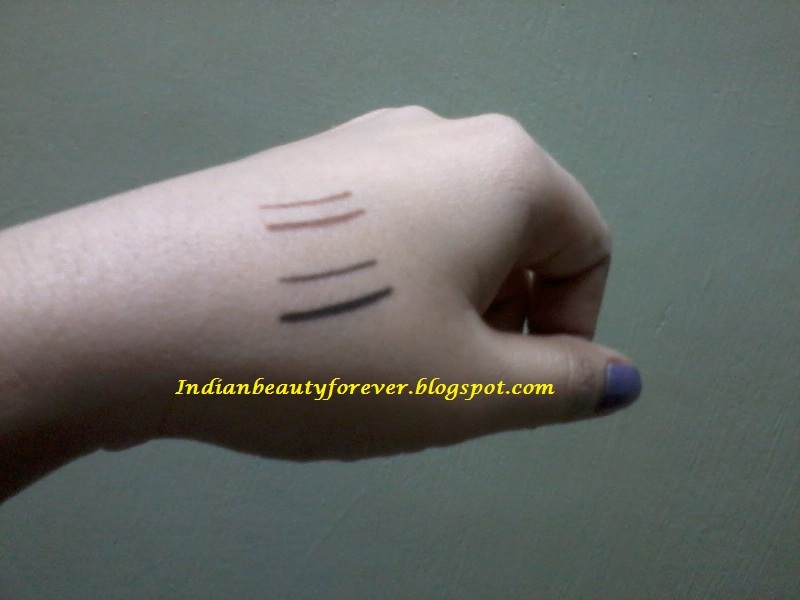 Pigmentation can be achieved in 2- 3 swipes. You can see the swatches below. Cream Eyeshadow- The cream eyeshadow comes in a small cute tub. It could have been more pigmented. In swatch it appears very pigmented but I swiped it 3 times. 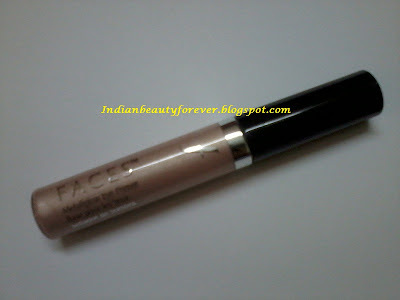 It can be used underneath other eyeshadows to darken their effect and as a base. Brushes- The brushes that came with this did not impress me at all. The bristles are soft but they would just not pick up the product well. Even application with finger can give far more better result than these. Packaging is reaaaally nice. I love it and I can easily carry it while on vacations in my luggage bag without being concerned of any potential damage. I really love the mascara. I wore it twice and I am satisfied with the results so far. 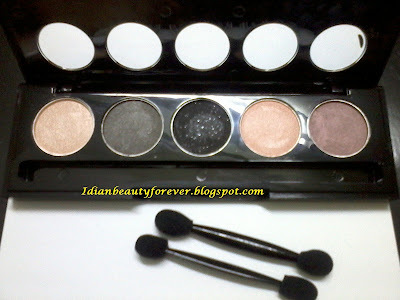 Eyeshadow pallete is amazing, the packaging itself and the colors that are there. Fine lovely shimmer is there but no large chunks except for the black one in which I think has been incorporated purposely for that glamorous night time party look. Cream eyeshadow is okay not much to say. 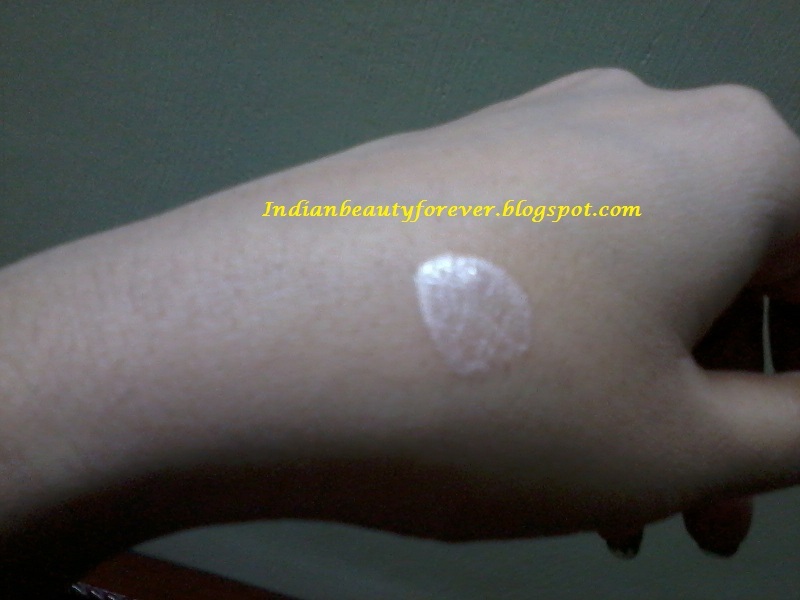 Metallic face primer is nice as it gives a pearly shine to your lids. However. May not be able to serve its basic purpose at its best. Eye pencils are okay and yes they do smudge. However, good point is that they did not tugged or pulled my eyelids. They are creamy enough. You can check the swatches. Cream shadow is not at all long lasting. 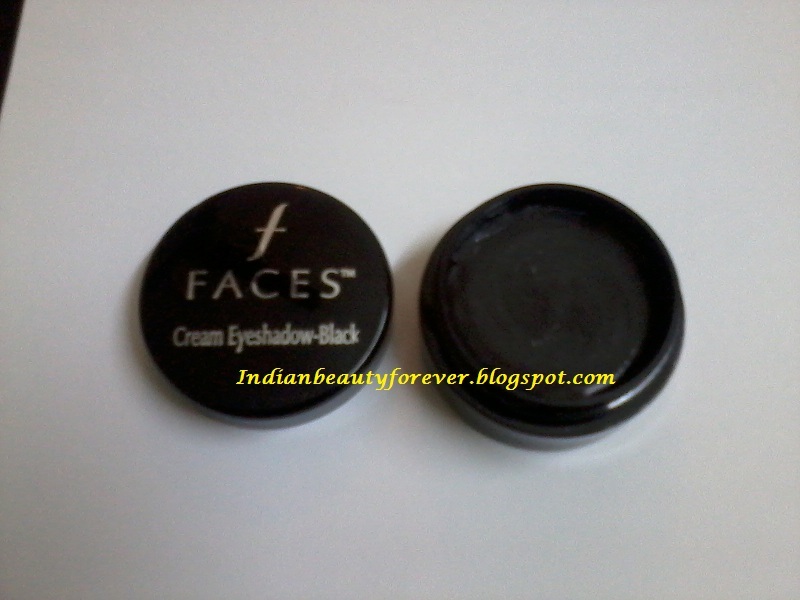 In a single swipe, its all gone leaving black patches on the lids. 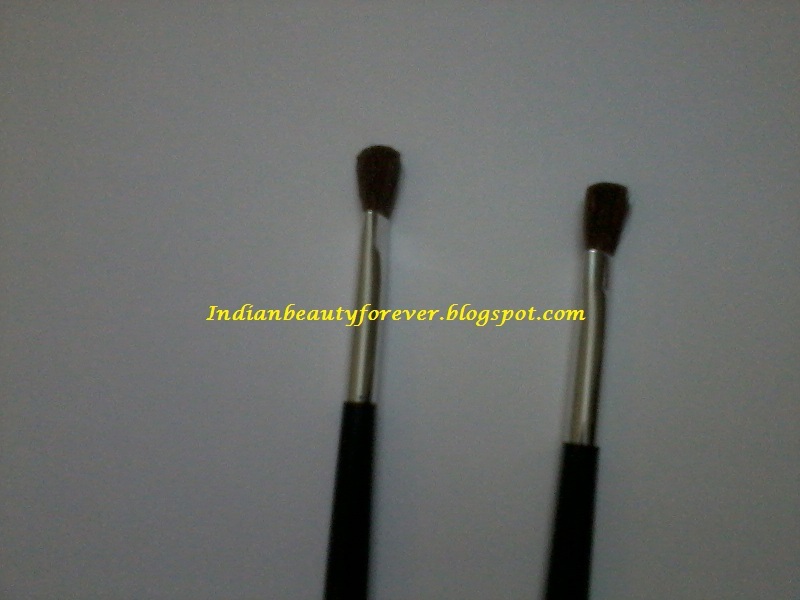 These eye shadow brushes have not impressed me much as I have seen some low priced brushes available in the market better than these. 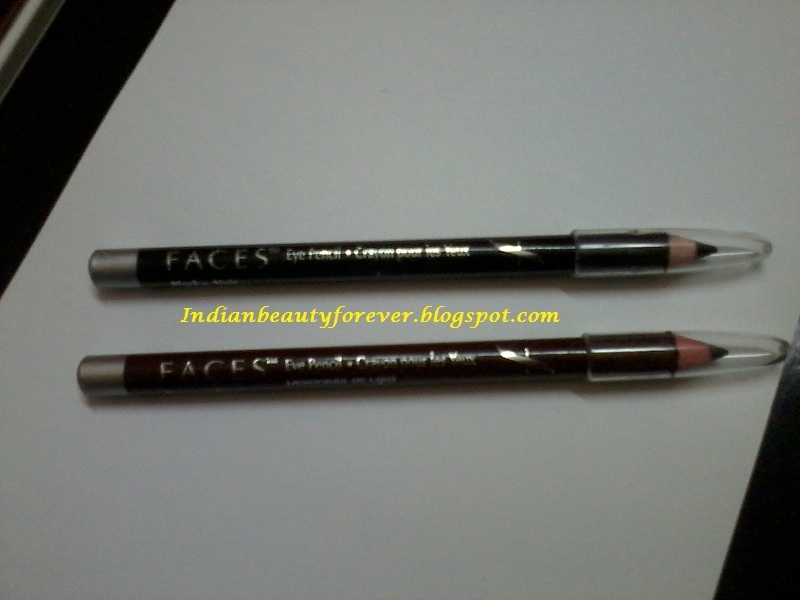 The eyeliner pencil smudges and they will not last long if you have oily lids or habit of touching your eyes like me. My Take- Keeping in mind the price that I have paid for this kit and the quality and the quantity provided. I will say that this is a nice kit overall . The eyeshadow palette was best amongst them and mascara being a close winner. Primer and eye pencils are okay, cream eyeshadow is only worth mentioning just to say that yes that was also a part of the kit, while the brushes are not even worth mentioning. good review. I have the same kit.